Compared to the history of the textile mills, the history of the dams and reservoirs has had relatively limited coverage. It was a point that was made in conversation with Dr John Fletcher when discussing with him his paper on Flints Reservoir. Anyone reading the acknowledgements in that paper will know that the premier worker in the field was Harry Armitage. His name even appears as a contributor to Harold D Bowtell’s 1979 magnum opus “Reservoir Railways of the Yorkshire Pennines”. In 1980 Harry Armitage produced a pamphlet entitled ‘“Dawson City” Heptonstall’ which in its first part dealt with the civil engineering aspects of the reservoir construction. This lecture, which had been eagerly anticipated by many members of the Hebden Bridge Local History Society, was linked to the publication of a new book on Dawson City and the Walshaw Dean Reservoirs called “City in the Hills”. That all 80 seats in the hall were taken and the back of the hall was packed with ‘Stewards’ demonstrated the great local interest that continues in this topic. A significant set of predecessors then, but we were not to be disappointed, neither in the book nor the lecture. The lecture was a tour de force by the joint authors Corinne McDonald and Ann Kilbey, ably assisted by the maestro of images, our esteemed President, Frank Woolrych (who was also the picture editor for the book). Whereas Bowtell focused by definition on the railways and steam engines, Harry Armitage drew attention to ‘the hazards of life around the reservoir workings’, the research for this lecture broke new ground in looking at the difficulties Enoch Tempest had with the tendering exercise and the consequences of winning a contract he didn’t really want. It alluded to the machinations that on the one hand presented a stream of financial difficulties for Tempest, whilst at the same time allowed the creation of a waterman’s ‘cottage’ with a Carrera marble fireplace! 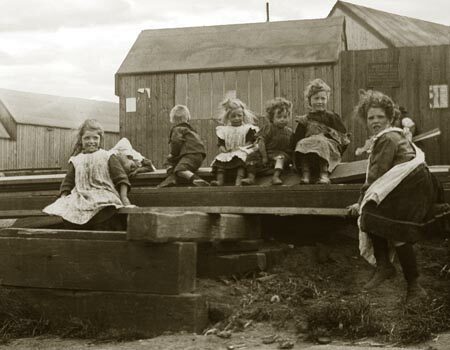 Of equal importance has been the exploration of the social history that is linked to Dawson City. 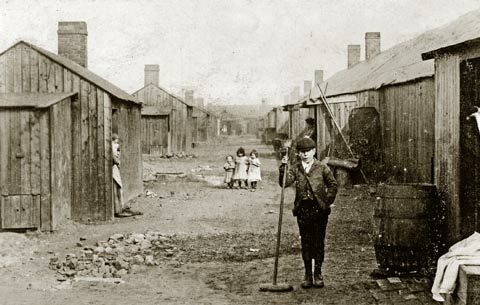 The Navvy’s Mission, the first aid training by the site doctor, the lack of licensed premises on the site and the presence of ‘The band of Hope’ and the use of the census to demolish the myth that all Navvies were Irish labourers all broke new ground and destroyed some stereotypical assumptions as did a more detailed understanding of the small pox outbreak, the consequent reception the workers received in the neighbourhood and the articulate nature of the ‘Nomads’ response. This was an excellent lecture, attended in strength by the Armitage family, and given the added benefit of having an original tender document available courtesy of Molly Sunderland. The long and detailed questioning after “mince pies” demonstrated the links many members families had in the past with Dawson City and the Reservoirs. The questioning also established that this is a fertile field for further research, with plenty of material out there waiting to be recorded. 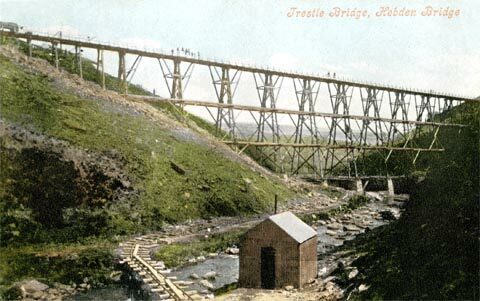 The next meeting of the Hebden Bridge Local History Society, is on Wednesday 9th January at 7.30 in the Hebden Bridge Methodist Hall when the speaker will be Tony Wright from Wild Rose Heritage & Arts with his Untold Stories. For full details visit www.hebdenbridgehistory.org.uk or your local library.